We visited classes and helped individual students as needed. The teacher assigned very specific resources down to the newspaper publication name (New York Times), so many students were able to find what they were looking for, but a few groups, those who read Behind the Beautiful Forevers: Life, Death, and Hope in a Mumbai Undercity, Escape from Camp 14: One Man's Remarkable Odyssey from North Korea to Freedom in the West, and Little Princes: One Man's Promise to Bring Home the Lost Children of Nepal, struggled to find newspaper their articles and videos. 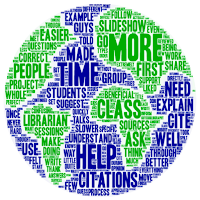 We paused this three part lesson (below) after each section to help individual students cite each resource type (newspaper, video, and a website). 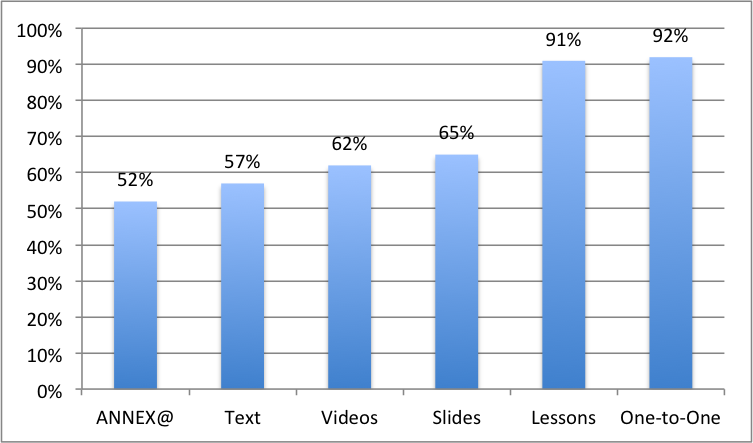 For homework, students finalized the works cited they had nearly completed during the lesson. They submitted their works cited drafts the next day. We met with the classroom teacher to review and calibrate our feedback on a few sample assignments, and then we (librarians) reviewed all the students work and gave them feedback. We did this with hard copies, which I found difficult because we tend to visit the sites students cite and doing without hyperlinks on which to click was impractical. In the future, we will ask for Google Docs submissions. Once the drafts with comments were returned to students, the revision process began. It took two days of revisions, working one-on-one with individual students before their were able to submit correct final drafts. For some students, this meant generating as many as nine drafts. Here is the rubric. 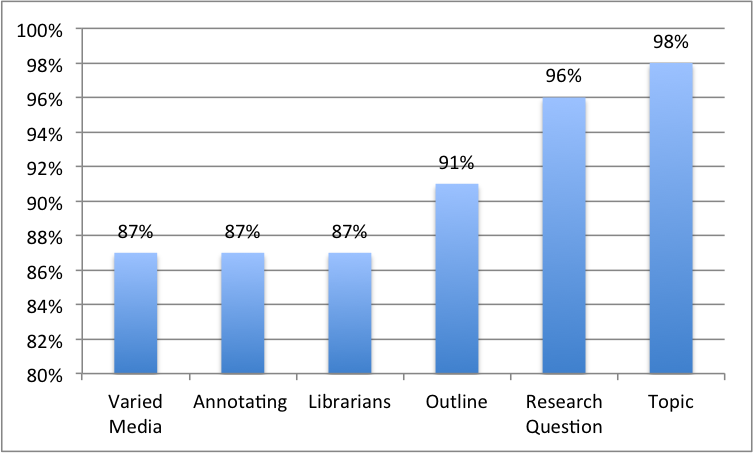 The revision process was rigorous as students were asked to obtain librarian approval before submitting their final drafts. 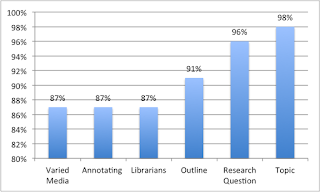 In looking at the revision history for each works cited in Google Docs, we noted that 40% of the students revised their drafts once or twice and 26% revised them five or more times. Through the revision process, students brought up their grade by an average of 24 percent. In an exit ticket, students rated the value of NCHS library services. While the majority of students found all our services helpful, face-to-face lessons and one-on-one help rated the highest. To what extent were these library services helpful? I did not understand how to write citations very well after I wrote them. I just corrected what the librarians told me to correct. Would have been beneficial for you to explain in more detail the order of things within our citations. Explaining why the citations need to be so specific would probably helpful. To what extent did these impact my learning? There was one glaring gap for us. Only 57% of respondents said THE ANNEX@ was helpful (lowest ranking of all library services) and yet 16% of respondents said our instruction would be enhanced if we provided online access to our lessons. All our lessons are posted on THE ANNEX@, including those we presented in class for this project. A related suggestion urged teachers to remind kids about library services. 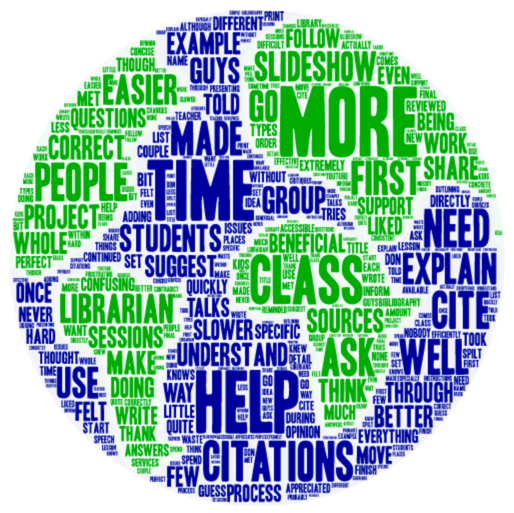 One student advised us to facilitate format-based mini workshops (e.g., newspaper articles, websites, videos) for students who needed help on specific citations. Here is the behind the scenes story to it.